Shopping online for a new set of luggage, or surfing the web for a great buy on airfare or hotels? What if you knew a way to shop where you could save money and donate to your favorite cause at the same time? It doesn’t just sound too good to be true, it actually is, thanks to a company called Goodshop. JJ Ramberg, co-founder and managing director of Goodshop, spoke with RewardExpert about how easy it is to find deals on just about anything, including trips and travel-related items, and in the process donate to a cause you’re passionate about. 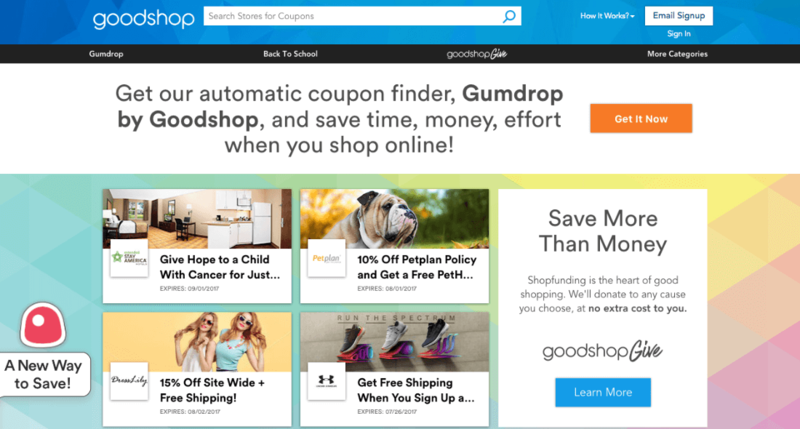 As a result, Goodshop was born, which aggregates coupons from more than 40,000 stores and travel sites. In addition, the company’s browser button, known as Gumdrop, provides automatic coupons, without having to search for them. “Every time you’re at an online store, it will find and apply the best coupon for you to get the best savings,” stated Ramberg. Since the service was started, Gumdrop has saved users more than $143 million. While Goodshop provides endless ways to save, there is also a unique charitable piece that sets Goodshop apart from other online coupon sites. “The other half of the story is that when Ken and I launched this company, we were inspired by socially responsible companies like Patagonia and Ben and Jerry’s and campaigns like the (RED) Campaign, which partners with top brands, including Nike and Apple, to sell red-colored products to fund AIDS research,” explained Ramberg. At the time Ramberg and her brother were developing the idea, she was working as a reporter for CNN in New Orleans during Hurricane Katrina. She saw the devastation and was looking for a way to help. So far, Goodshop has raised nearly $13 million for charities and non-profits. “We attract customers who care about a cause and want to support it while shopping. It’s a really nice way to turn an everyday activity into a moment of giving back.” Ramberg, who is also host of the program Your Business on MSNBC, said that millions of dollars have been donated to build playgrounds, fund cancer research, find homes for stray dogs and more. Goodshop is not just for shoppers but is also for travelers, too. Since Goodshop works with over 40,000 retailers, they cover just about everything – including travel. “We are connected with places like Orbitz, Priceline, Travelocity, Hotels.com, airlines like Delta and United Airlines and stores like Patagonia, Land’s End, Luggage Guy and Kenneth Cole,” said Ramberg. In essence, they’ve got you covered from buying the right luggage to booking your trip, planning your flight, making hotel reservations and more. “The best thing to do is to add Gumdrop, and then you will automatically get any coupon codes that are out there,” explained Ramberg. And the best part is knowing that you’re saving more than money. You’re shopping to help donate to a good cause, at no extra cost to you.